This lovely, muted purple cake is stunning. 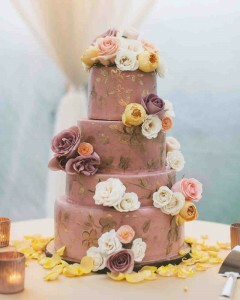 The four-tier cake is frosted with a purple cream cheese icing and adorned with gold leaf details and fresh flowers. And it’s perfect! This cake would be lovely any time of year, but I’d love to see it at a late winter or early spring wedding. You’ll find this pretty purple cake here. It was created by One Sweet Slice.